Fourth-year quarterback Chris Merchant threw for 251 yards and two touchdowns to help lead the Western Mustangs to a 47-24 victory over the Saskatchewan Huskies, capturing the Mitchell Bowl and booking a trip to their second straight Vanier Cup. Merchant, who was named the MVP of the Yates Cup last weekend, earned the honour once again tonight in the Mitchell Bowl, racking up 82 rushing yards and one rushing touchdown to go along with his passing clinic. The Saskatchewan defence pressured Western through their first drive of the game, forcing the Mustangs to punt following a hit on Merchant. The hit not only affected the drive, but the entire Mustangs’ offence, as Merchant was forced to leave the field with a lower-body injury following the hit. Running back Alex Taylor also had a strong day for the purple and white, rushing for 141 yards and two touchdowns while wide receiver Harry McMaster chipped in 152 receiving yards and two touchdowns as well for the Mustangs. On the other end of the field, it was Fraser Sopik who once again spearheaded the Western defence on the night, totaling a game-high 11 tackles. The Huskies were led by quarterback Kyle Siemens and running back Tyler Chow. Siemens recorded an incredible 247 passing yards, two touchdowns, and no interceptions, while Chow rushed for 143 yards on the night. The Huskies took full advantage of their defensive effort, as Chow ran through the Mustangs’ defensive line with ease to set up Siemens’ touchdown throw to Colton Klassen and giving Saskatchewan the early 7-0 lead. However, after a fumble recovery positioned the purple and white on the Huskies’ 45-yard, Merchant capped off his return to action with a touchdown pass to McMaster to tie the game at 7-7 heading into the second quarter. But despite the strong start in the opening quarter for the Huskies, it was the Mustangs who struck first to begin the second frame, as Merchant connected with McMaster yet again with an incredible reception to give Western the slim 14-7 lead early in the second. Saskatchewan’s Sean Stenger connected on the first field goal of the game minutes later to cut the deficit to 14-10, while the Huskies’ defence forced the Mustangs to punt once again on the ensuing drive. The back and forth battle continued throughout the quarter, as Klassen caught his second touchdown of the evening to allow the Huskies to retake a 17-14 lead midway through the frame. Yet another late hit forced Merchant to leave the game for a series before returning on the following drive. But following his return, Merchant showed no signs of slowing down, relying on a rushing game that has emerged throughout the playoffs and putting kicker Marc Liegghio in prime position to tie the game at 17-17 with a field goal to end the first half. The beginning of the third quarter belonged to Taylor, who burst through the Huskies’ defence and marched the Mustang offence downfield to kick off the second half. Taylor’s effort ultimately placed Merchant in prime position for his first rushing touchdown of the day to give Western the 24-17 lead midway through the quarter. The frame remained a defensive showdown until the end, as Western earned a late safety to give them a 26-17 advantage heading into the fourth. Saskatchewan’s physicality remained a focal point on both sides of the ball to begin the final stanza, but penalties continued to haunt the Huskies’ offence, as they did in the first half. On the other side of the ball, Taylor continued to carry the Mustangs’ second-half offence, scoring his first rushing touchdown of the playoffs with a 58-yard run to extend Western’s lead to 33-17. However, Chow would respond on the ensuing drive for the Huskies, matching Taylor with an enormous 71-yard run of his own to cut the Western lead to 33-24 midway through the frame. But despite the Huskies’ resiliency, yet another rushing touchdown from Taylor would keep the lead out of reach, extending the advantage to 40-24 late in the quarter. A turnover on downs on the Huskies’ 27-yard line ultimately put the game away, giving running back Cedric Joseph the opportunity to extend Western’s lead with another touchdown and eventually cruise to the 47-24 Mitchell Bowl victory.
? Halftime interview with @WesternMustangs' Head Coach Greg Marshall ? 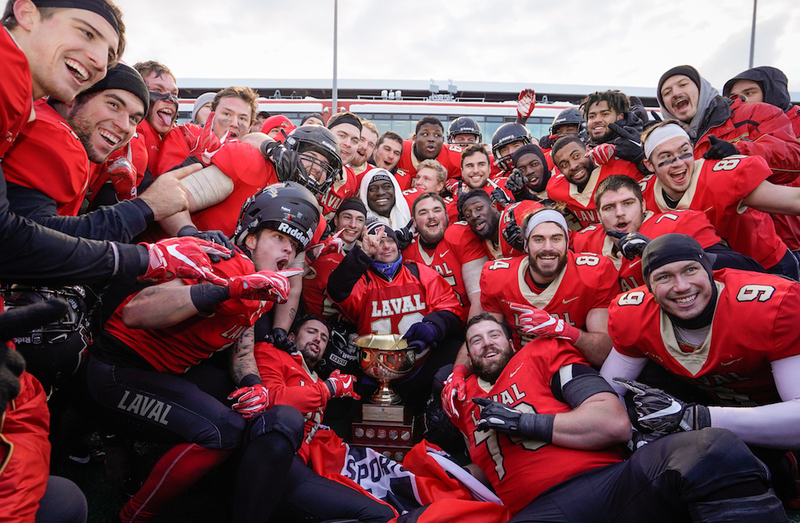 With the win, the Mustangs will move on to take on the Laval Rouge et Or in a rematch of last year’s national championship in the 54th Vanier Cup Presented by Promutuel Insurance next Saturday in Quebec City at TELUS-UL Stadium. Kickoff is scheduled for 1 p.m. ET / 10 a.m. PT on Sportsnet 360, Sportsnet One and TVA Sports. The broadcast is also available online through Sportsnet NOW and TVASports.ca.